Stock status is current as of 4/22/2019 6:40 AMET. Efficiently Power Office Equipment on the Road. Want to increase your productivity while on the road? Here's a great idea from Tripp Lite. This device allows you to harness your vehicle's battery to efficiently power office equipment on the road. 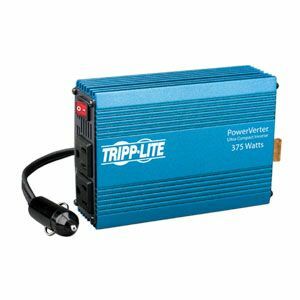 Continuously supplies up to 375 watts of 120V AC power to 2 AC outlets from any 12V battery or automotive DC source. Convenient cigarette lighter DC input jack with 3-ft. cable provides 1-step installation. Portable and compact, the inverter's design is among the most rugged available thanks to its lightweight metal casing.